Call me a reactionary, call me a Murdoch lackey, but the fact is that, after a vague flirtation with the concept that "information wants to be free" and years of internet surfing, I feel a sense of revolt. It's been fun: like a jammed fruit machine spewing free tokens or a whisky-galore shipwreck. But it's got to stop. Content -- whether music, films, pictures, news or prose -- can't be free and flourish. The music and movie industries are fighting: journalism, after the ego trip of gaining millions of online readers, is following. It has to. There is no alternative. The labourer is worthy of his hire, time is money, pay peanuts and you get monkeys. Pay nothing and you get dumb (or worse, venal) monkeys. Nothing costs nothing. Whenever I read an unhappy rant like this from a journalist, it makes me wonder how they could know so little about where their paycheck is coming from. Newspaper readers have never paid for their news, outside of rare exceptions like the Wall Street Journal and trade publications such as Variety. Daily newspapers derive most of their revenue from advertisers. Lauren Rich Fine, a former newspaper industry analyst with Merrill Lynch, estimated that historically, subscriptions generated 20 percent of a newspaper's revenue and the other 80 percent came from classifieds and display advertising. So back in the glory days of newspapers before the Internet ruined everything, readers were getting their journalism at a steep discount paid for by advertisers. Newspapers were the biggest game in town for local classifieds and department store ads and papers enjoyed extremely fat profit margins because of it. But if there's one thing that a journalist should be in a position to know, it's the fact that times change. Even today, Internet freeloaders aren't getting their news for free. Nine different ads are running on the page that includes Purves' Times of London column. The real issue here is that online ads aren't generating the kind of revenue that other ads did for decades, so it's an extremely rough time for the industry. But placing the blame on readers for being cheapskates is extremely misguided. We've always gotten the news at a price much lower than the cost of reporting it. 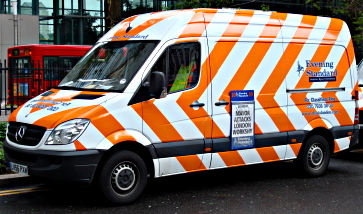 Credits: The photo of the Evening Standard van by Oxyman is available under a Creative Commons license.